Valentine's Day is the most romantic day of the year - and this year if your romantic partner is overseas in Australia we can help! At Direct2florist our member florists specialise in sending Valentine's roses from New Zealand to Australia on 14th February. 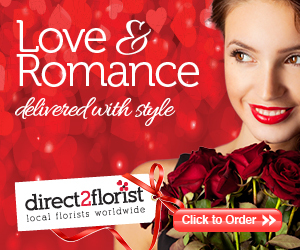 So if you need to send romantic roses or a valentines bouquet to Australia that's why Direct2florist is here. Our member florists can arrange delivery on February 14th - ensuring your special message is received by your Valentine. Our florists in Australia have been star rated and reviewd by previous customers. With over 40,000 direct2florist reviews received - you can be sure of exemplary service by our superior florists. Be sure to get your order in early. As you might expect Valentine's is very busy for florist and unfortunately customers tend to leave ordering until the last minute. To guarantee the very best roses we recommend customers to order early! Make sure your order gets priority. Although last minute orders are welcome - be aware florists do begin to sell out on the big day! Big sellers this Valentine's day will be the classic dozen red roses and a florists favourite a Valentines gift bouquet. Traditionally a Valentine's gift bouquet will include a sing red rose, red and purple flowers and romantic wrapping. As you are leaving the flower selection to the florist, this is often the best one to pick since you are leaving it the expert.